Officine Panerai presents the Radiomir Platino – 47mm and Radiomir Oro Rosso – 47mm, two exquisite new Special Edition models inspired for the first time by a rare example of the Radiomir dating from the late 1930s. 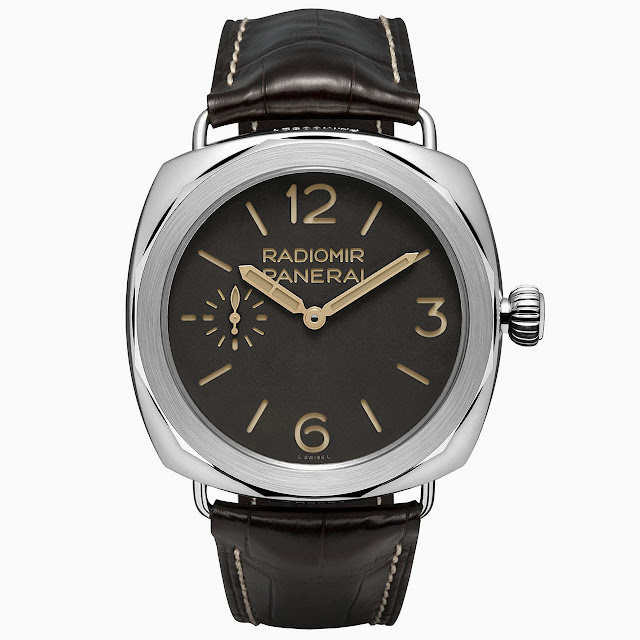 At the same time as it was supplying the Italian Navy with watches designed for the underwater missions of its commandos, the Panerai store in Florence made a few examples of the Radiomir with a special 12-sided bezel, carrying the inscription “OFFICINE PANERAI – BREVETTATO”. The presence of this inscription, referring to the patent of the luminous substance Radiomir which later gave its name to the watch itself, suggests that these models were not for use in wartime operations but rather for presentation to the military authorities who were testing the new instruments. 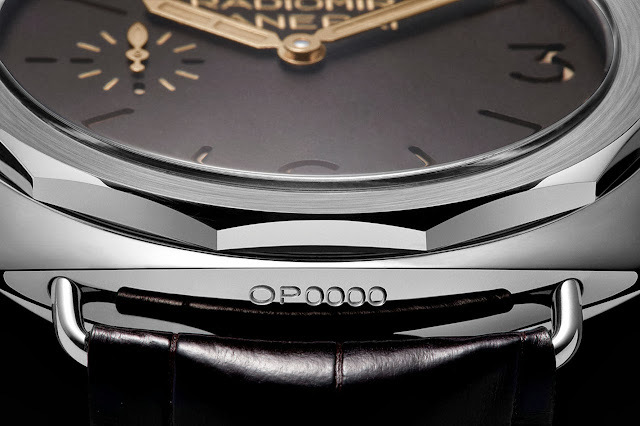 The new Radiomir watches faithfully reproduce the 12-sided bezel of the historic models but the engraving appears only on the back, surrounding the sapphire window through which the movement can be seen, as in the original model. The case reproduces the three-piece structure of the time, with the bezel and back screwed directly to the caseband: a type of construction making it quicker to assemble the watch and easier to replace internal components where necessary. Made of platinum or red gold, the case has slender wire loop strap attachments that are removable for replacing the strap and the same diameter of 47 mm as the original examples. 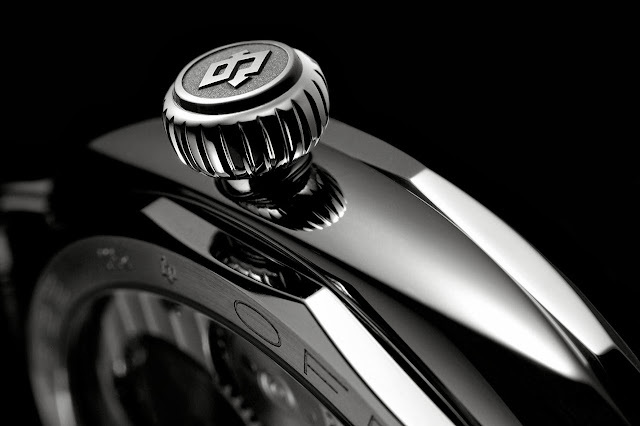 The vintage character of the watch is reinforced by its original spherical winding crown. 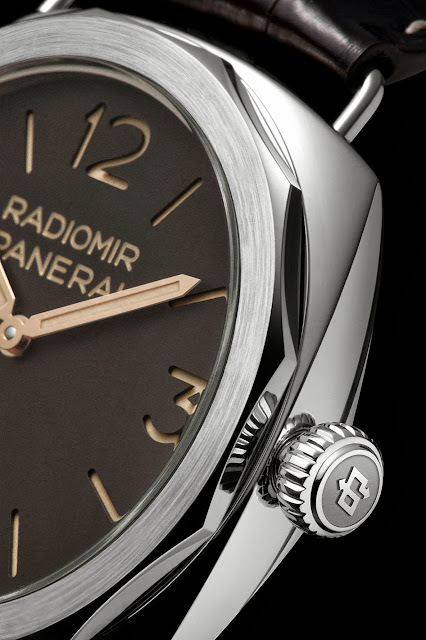 As in every Panerai, the dial has a strong, clean design giving it the maximum clarity and legibility, aspects enhanced by the elegant contrast between the dark brown of the dial and the ecru of the luminous substance placed between the two superimposed discs forming the traditional sandwich construction. The dial is surrounded by the 12-sided bezel with brushed finish, contrasting with the polished case, and it is protected by a slightly cambered Plexiglas® crystal, as in the historic models. The sophisticated OP XXVII calibre has been built on a Minerva 16-17 base, a hand-wound movement strongly associated with the history of the Florentine maker. The relationship between Panerai and Minerva certainly already existed in the 1920s, as is shown by an invoice of 1927 issued by the Orologeria Panerai store to the Archbishopric of Florence relating to the supply of two Minerva watches. The collaboration has included not only watches but also timers for timing mechanisms used in torpedoes and other explosive devices. The OP XXVII calibre, already used by Officine Panerai in other rare Special Editions on account of its horological quality, has a balance wheel with screws in the rim for adjusting the rate, a balance spring with Phillips curve and a precision swan-neck regulator. With 18 jewels and screw-in jewel settings, it has nickel-silver bridges with côtes de Genève finish and a power reserve of 55 hours. Identified by the reference PAM00521 and PAM00522 (engraved between the lugs), the new Radiomir Platino and Radiomir Oro Rosso are being made in limited editions of one hundred units each and are supplied with a brown alligator strap fastened by a folding clasp of white gold or red gold respectively. Inspired by the water-resistant originals, the new models are water-resistant to about 50 metres. 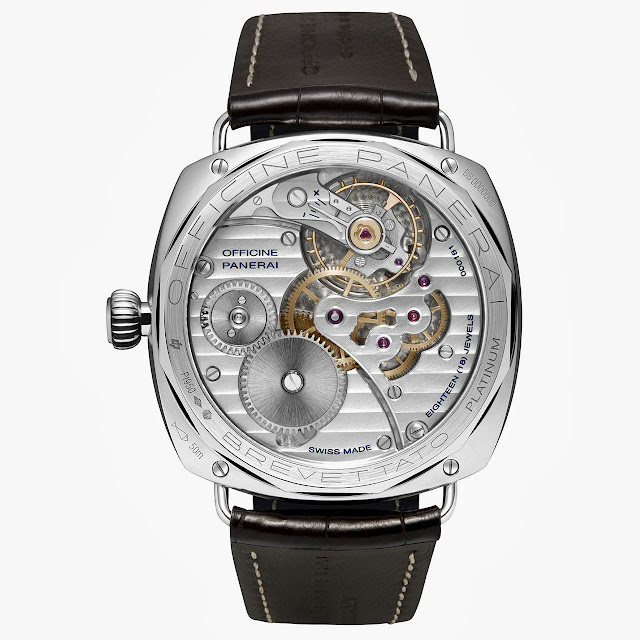 Movement: Hand-wound mechanical, exclusive Panerai OP XXVII calibre, base Minerva 16-17, 16¾ lignes, 18 jewels, Glucydur® balance, 18,000 alternations/hour. KIF Parechoc® antishock device. Swan’s neck regulator. Power reserve 55 hours. Case: Diameter 47 mm, polished platinum. Screw-down winding crown personalized OP. Bezel: Brushed platinum with polished edges. Dial: Brown with luminous Arabic numerals and hour markers. Seconds at 9 o’clock. Crystal: Plexiglas®, 2.1 mm thick. Strap: PANERAI personalised alligator strap and 18 ct. adjustable polished white gold buckle. Supplied with a second Plexiglas®.